Nestled in the farmland just south of Reading, Pennsylvania, Maple Grove Raceway has a long history as a haven for motorsports. It began as a half-mile oval dirt track in the 1930’s, and began hosting fifth-mile drag racing in 1962. It couldn’t be more fitting then, that it’s also the home of the Glory Days Nostalgia Drags. A beautiful Buick Rivera and Merc Sled highlighted the lifestyle component of the weekend. Sunday’s races were preceded by an all-new Rockabilly-themed cruise night on Saturday to kick off the festivities. In addition to live performances by several bands and a pin-up girl contest, the cruise night provided an opportunity for racers to arrive early and set up for the next day. We arrived early Sunday morning to peruse the Glory Days Car Show while racers went through tech inspection. This event yielded a fair number of truly unique vehicles, including a well-preserved Chevy cab-over wedge truck hauling a vintage front-engine dragster. 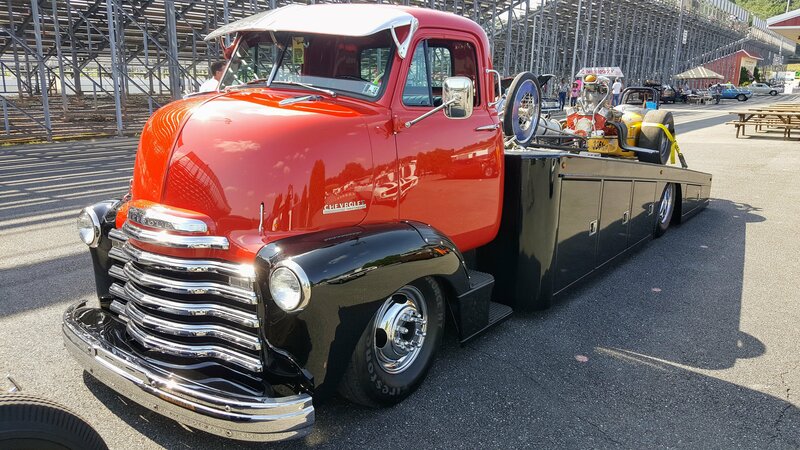 A vintage cab-over wedge truck that was hauling a front engine dragster. When there’s an abundance of interesting rides packed into a small lot, it can be easy to pass by the hidden gems. But when that gem is a classic Fiat body propped up over a tube frame chassis, visibility is no longer a concern. We sat down with owner Bob Hershey to get the story on his insane build. Looks like a 1959 Fiat 500 on the outside … but a looking inside tells a different story. When Bob first encountered this Fiat Nuova 500, it was already on its way to greatness. The vehicle belonged to his friend, Mark Perez, who had owned it since he was 16. Mark had prepped the body and even gone so far as to chalk in flames on the fenders to outline his plans, but decided to sell it to make room for other projects. He told Bob “If you ever sell this car, you gotta sell it back to me”. Unfortunately, Mark passed away in an ATV accident shortly after the sale. The Fiat collected dust for a while before Bob set to building the tribute. A cursory glance makes it clear that none of the original underpinnings remain. The custom tube-frame chassis was designed and fabricated by Legacy Innovations in York, Pennsylvania. Legacy also constructed the headers and mounts that allow a massive 725 horsepower Reher-Morrison 427 big-block to rest between the fenders. Topped with a Hogan’s sheet metal manifold and two 750 Dominators, the small-block lays down power through a Lenco four-speed and a Ford 9-inch rear. With front-end space at a premium, a rear-mounted radiator setup was necessary to provide cooling. Inside Bob Hershey’s incredible Fiat 500 dragster. Although it remains a Fiat in appearance only, it’s crazy to think that this car made only 17 horsepower when it rolled off the assembly line in 1959. Bob has only had the car on the road for a few months, and it hasn’t seen the track yet. But, we look forward to seeing more of it in the future. With tech inspection coming to a close, we walked down to the staging lanes to check out the action. This year marked a bumper crop of attendees, with racers turning out in droves to run down the strip. More than 285 vehicles had registered to race in eight different brackets. With every driver qualifying at once, the staging lanes transformed into a never-ending parade of gassers, slingshots, funny cars and street rods. The high attendance was no doubt bolstered by the support of local racing clubs and organizations, each running their own respective competitions. A variety of old iron made the trip. The Mid-Atlantic Nostalgia Drag Racing Association (MANDRA) drew in 31 members to compete in an eliminator. The crew cranked up the competition early with a grudge match during the first round of time trials. Ralph Ferraro’s 59 Lyndwood dragster took the prize – a case of Seagram’s coolers – when his opponent fouled out with an early light. Due to the odd number of racers, each round had an earned bye-run. In the semi-final round, Bud Poust’s ’70 Nova edged out Dave Drissel’s ’70 Chevelle with a near perfect reaction time, while Merritt Snyder took the bye-run in his ’65 Cyclone. Maple Grove’s Sunday curfew put a stop to racing before a winner could be decided, but MANDRA will run the final during their next event at Beaver Springs Dragway. The North East Timing Association (NETO) ran two separate eliminators. NETO accepts a wide variety of vehicles from front engine dragsters and altereds, to gassers and stockers, provided they were built prior to 1980. The Nostalgia bracket runs a .500 full tree for vehicles 10 seconds and slower, while the Competition Bracket rolls the faster cars on a .400 Pro tree and .10-second incremental dial-ins. Paula Nappi took the win in the Nostalgia Bracket over former NHRA world champion Ed Hedrick with a 10.73-second pass in her ’79 Corvette. Vinny Laurita racked up his second Competition Bracket win of the season in his wheelie-prone ’69 Camaro. Vinny Laurita’s Camaro leaps into action. He would go on to win his class. The Back Seat Drivers put on a great show with just a handful of members. As the name implies, Back Seat Drivers is a racing club limited to front Engine Dragsters. Events like Glory Days provide a rare chance to witness these wild machines dance down the strip. Tom Hand drove Steve Hand Sr.’s ’68 slingshot to victory over John Schroder’s ’69 digger with a 9.63-second pass. The 422 Allstars were on hand to run a handicap-style eliminator. This eight race series has a rather strict set of rules, and is limited to American-made performance cars from the 1960’s. Competition was fierce going into the semi-finals, with points leader John Warehime lined up against number one qualifier Kevin Grassan’s ’64 Polara. Grassan caught a red light, giving Warhime a walk, but the rearend on his ’66 Chevelle gave out on it’s way to victory. John Reed took a solo run in his ’67 Coronet, and was poised for the final battle, but Warhime was unable to repair his vehicle in time and was forced to forfeit. The East Coast Gassers (ECG) made a great showing for their fifth race of the season, attracting 17 drivers to the event. 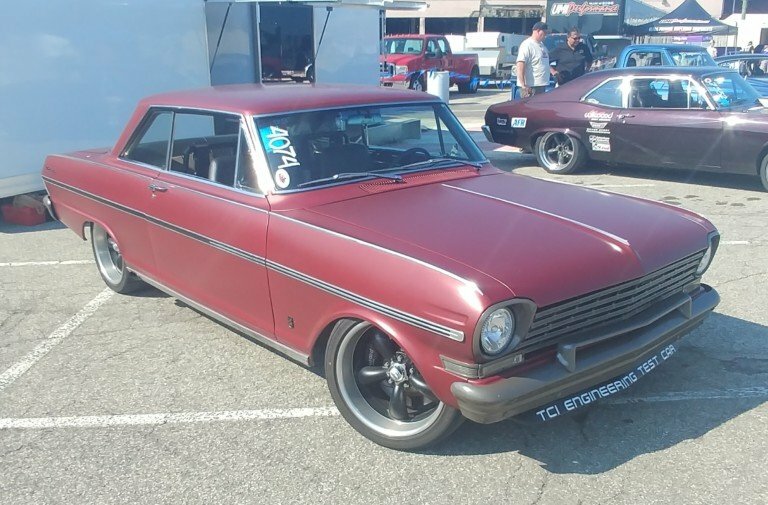 ECG limits their membership to 1965 and older vehicles that closely resemble the gasser style, which results in a unique throw-back feel on pit lane. These races are easily among the most entertaining to watch, and their members don’t come out to play around. Round two of eliminations provided a particularly tense moment when the rear axle on Greg Grubel’s ’51 Chevy coupe decided to stay at the starting line. Luckily, Greg was able to steer out of danger, escaping major damage to the vehicle. The final round saw a close match-up between Robert Carson’s ’55 Chevy and Kevin Lynch’s ’65 Nova. Carson slipped by for the win when Lynch spent just a bit too long behind the tree. A parade of gasser’s lines up to do battle. Maple Grove ran two additional brackets with their Nostalgia Bracket, welcoming all vehicles 1990 and older, provided they were bare of electronic assistance. This bracket was far and away the largest field, drawing over 100 racers into the fray. Unfortunately, the races had to be halted after the fifth round due to the track’s Sunday curfew of8:00 p.m. The last car’s standing were Steve Dickey’s ’69 Camaro, Bill Klaus’s ’67 Dart, Paul Werner’s ’80 Malibu, and Leeann Ormsbee’s ’79 Corvette. The track also ran a Geezer’s Eliminator for drivers 55 and older. This bracket had the widest variety of vehicles, ranging from a ’53 Chevy Bel Air up through a Fox Mustang. It all boiled down to a mid-seventies shootout with John Snyder’s ’75 Granada taking the win over Dennis Grejda’s ’72 Maverick. The sun sets over Maple Grove Raceway as the tower races to finish all the brackets before an 8:00 p.m. curfew. From the massive turnout of drivers that pushed racing into the night, to the incredible builds we saw in the car show, this year’s event was a clear indication that nostalgia drag racing is alive and well on the East coast.